The Kampon ni Pakakak, the oldest and most respected socio-civic organization in Batangas province, elected its 2019 officers led by business leader Dr. Jose P. Leviste Jr. as President to sustain the group’s vision of a Greater Bauan, Batangas in preparation for the KNP Centennial in 2022. Former Vice President Jejomar C. Binay (center) administers the induction of the 2019 officers of the Kampon ni Pakakak led by Dr. Jose P. Leviste Jr. (fourth from left) who was elected as the new President, succeeding former Makati City Mayor Jejomar Erwin Binay Jr.
Former Vice President Jejomar C. Binay, himself a former president of KNP, inducted Leviste and other newly elected officers of the group recently. Leviste’s immediate predecessor is former Makati City Mayor Jejomar Erwin Binay Jr.
KNP is an association of distinguished citizens of Bauan who work closely with fellow Batanguenos both within Batangas, in the Philippines, and abroad. Other previous KNP Presidents were House Deputy Speaker Raneo Abu, Batangas Governor Herminigildo Mandanas and Dr. Miguelito de Guia who served in 2017. As President of KNP, Leviste brings with him decades of experience in top management and business leadership. He is currently the President of the Batangas Provincial Investment Council, which is chaired by the Provincial Governor. Leviste is the Chairman of Atlantic, Gulf and Pacific Co. of Manila and Chairman of OceanaGold Philippines Inc. He is the Primo Consiglieri of Italpinas Development Corporation, the developer of the Miramonti Towers in Sto. Tomas, Batangas. Leviste is a Director of the Philippine Chamber of Commerce and Industry and served as Chairman of PCCI’s 2017 Philippine Business Conference. He is Chairman of PCCI’s Philippine-Spanish Council, Vice Chairman of the Philippine-Swedish Business Council, Resident Representative of the Australia Philippines Business Council, a Director to the Vice Chairman of the Chamber of Mines of the Philippines and a Governor of the Philippine Constitution Association. He is a member of the Governing Council of the Philippine Council for Agriculture Aquatic and Natural Resources Research and Development of the Department of Science and Technology. 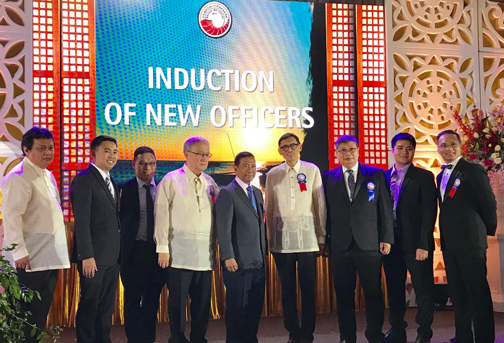 Also inducted as 2019 KNP officers in time for the organization’s 97th anniversary are Bauan Mayor Ryanh M. Dolor as Vice President; Mr. Ernesto V. Arada Jr., Secretary; Dr. Rogelio C. Tarriela II, Treasurer; Roselito H. Castillo, Auditor; Atty. Jovencio Y. Karaan, Legal Counsel; Gen. Edgard Arevalo, P.R.O. ; and MGen. Emeraldo Magnaye, Sgt. at Arms. KNP’s Council of Advisors includes former Vice President Jejomar C. Binay, House Deputy Speaker Raneo Abu, Batangas Governor Herminigildo Mandanas, Atty. Rogelio Flor Tarriela and Engr. Juanito Rosales. KNP is a non-stock, non-profit organization which has 97 years of fostering fellowship among its members, instilling civic pride and rendering service to the community, to Bauan, to Batangas, and to the whole Philippines. Topics: Kampon ni Pakakak , Jose P. Leviste Jr. , Jejomar Erwin Binay Jr.